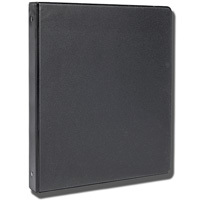 Black 1″ d-ring binder. Fits up to 225 sheets. Features a front and back pocket. For frequent use. Black 1″ o-ring binder. Fits up to 200 sheets. Features a front and back pocket. For light use. White 1″ o-ring binder. Fits up to 200 sheets. Features a front and back pocket. For light use. Create custom covers with the insertable front, back, and spine! Black 1.5″ d-ring binder. Fits up to 350 sheets. Features a front and back pocket. For frequent use. 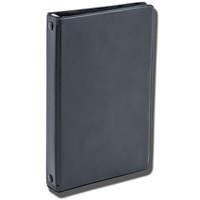 Black 1.5″ o-ring binder. Fits up to 300 sheets. Features a front and back pocket. For light use. White 1.5″ o-ring binder. Fits up to 300 sheets. Features a front and back pocket. For light use. Create custom covers with the insertable front, back, and spine! Black 2″ o-ring binder. Fits up to 400 sheets. Features a front and back pocket. For light use. Black 3″ d-ring binder. Fits up to 600 sheets. Features a front and back pocket. For frequent use. Black 3″ o-ring binder. Fits up to 500 sheets. Features a front and back pocket. For light use. 6 ring binder measures 5″ X 3″. Ring binder, six ring, holds 6.75″ X 3.75″ paper. Assorted colors - our choice please. 1″ White O-ring binder with silver Bucky heads allover. Also details "University of Wisconsin" and a Bucky head on the front in red and "University of Wisconsin" on the side. Two inside pockets.